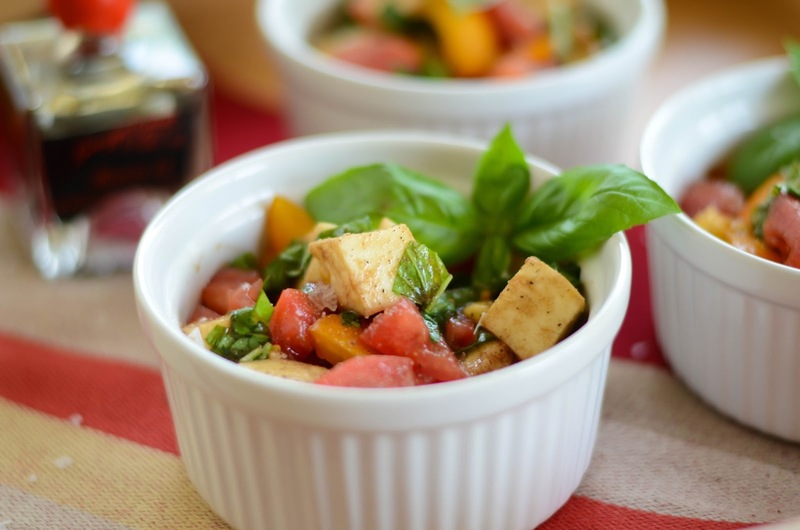 Summer just wouldn't be summer without a Caprese salad. You really can't go wrong with a mixture of perfectly ripe heirloom tomatoes, basil, fresh mozzarella and balsamic. Such simplicity for a meal, but it can easily be ruined by under or overly ripe tomatoes, cheap cheese and store brand balsamic. I love quality ingredients, and although I know not every one will understand the importance of them, there are a few things in your cooking arsenal that can't be compromised. Balsamic Vinegar is one of them. It should be smooth, with slight fruit and woodsy undertones, as well as having a light sweetness, without an overly powerful tartness. It will be hard to find one, but my recommendation is to find a place where you can taste the varieties on hand. Don't ruin it by using bread to try it. You should use a small sample cup and sip the balsamic alone, without anything marring the true taste of the vinegar. This is one of my favorites, Giuseppe Giusti. It's perfection. Truly. Combine the tomatoes, mozzarella, and basil together in a large bowl. Drizzle the vinegar and fold into the tomato mixture until evenly distributed. Allow to set for at least 15 minutes so the flavors combine with one another, then salt and pepper to taste. Caprese, in my humble opinion, is best eaten at room temperature.